Our loved ones are dealing with them. Our local firefighters are pitching in. And they can happen here, too. Last week, firefighters from Hillsboro, Forest Grove, Banks and other area agencies jumped into their trucks and did what they do best: They responded to a call for help. But these firefighters aren't headed to a fire in western Washington County. They're making their way south to assist with the largest, most destructive wildfires in the state of California. Oregon's neighbor to the south has been ravaged by fires this year, with more than 1.6 million acres burned this year alone, the largest ever recorded, according to the California Department of Forestry and Fire Protection. As you read this, both ends of California are burning. The city of Paradise, a city about the size of Forest Grove not far from Chico, was consumed by fire on Nov. 8. At least 29 people were killed, and more than 6,700 homes and businesses were destroyed. Many from Paradise are listed as missing. Two people died in fires near Los Angeles. Firefighters have a tough job ahead of them. As of this writing, the Camp Fire, where Washington County firefighters are working, is only 20 percent contained, and flames are licking the edges of Chico, a city about the size of Beaverton. President Donald Trump has said the fires are due to poor mismanagement of forestland, and threatened to pull federal funding for forest management altogether if the situation isn't resolved. Never mind the idiocy of believing that cutting funding will somehow make agencies perform better. Never mind that the fires in southern California are so-called "urban interface fires" spread by consuming grassland and shrubland, not forests. There are no forests on fire in Southern California. And never mind that only 3 percent of California's forestland is owned by the state to begin with. Nearly 60 percent of California's 33 million acres of forests are owned and maintained by the federal government. Most of the rest are either privately owned by timber companies and other industrial owners. Perhaps the president meant he would cut funding from the U.S. Forest Service? But this isn't an editorial about Donald Trump. It's not an editorial about poor forest management. Those are conversations for another time. We are fortunate here in northwest Oregon. Grass fires are all too common in the summer, but our wet weather this time of year keep us from similar autumn fires, and we don't have to worry about the Santa Ana winds exacerbating things. But there are a lot of ways to start a fire, and Oregon is far from immune to forest fires. Grasslands burn in Oregon, too. In just our own corner of Washington County, firefighters responded to plenty of grassfires over the summer. A two-alarm brush fire near Banks in September would have blown out of control if firefighters hadn't had all-terrain and utility vehicles on hand to access the rural blaze. 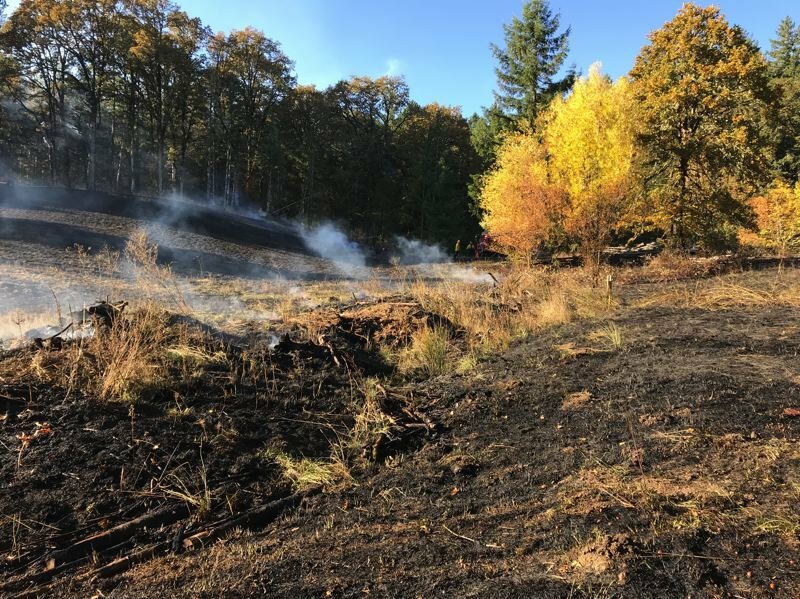 A month earlier, a blaze in the Gales Creek area burned 20 acres and was upgraded to a four-alarm fire before it was contained. This editorial board has written a lot this year about fire. We wrote in July that residents should be on alert for fire dangers during the heart of fire season. That hasn't gone away. The American Red Cross, California Fire Foundation, California Community Foundation's Wildfire Relief Fund and others are raising money to help the impacted areas. As we enter the season of giving, you could do worse than help the people who have lost not only their homes, but their entire city. These fires may be a hundred miles away, but they impact us, directly and indirectly. A former employee of this newspaper, who left us in July to teach at California State University in Chico, lost her home and everything she owned. Her family, thankfully, is safe and no one was injured. Two others in our office have loved ones forced to evacuate because of the fires. Another has family in Los Angeles County, and keeps an eye on news reports regularly. Our office isn't alone. We know many in our communities with ties to the burning areas. Hillsboro Mayor Steve Callaway grew up in Northern California. He posted a note on Twitter last week that his heart aches to see entire cities consumed by fire. He was in California last week for a conference of the National League of Cities. "Being in the presence of inspiring local elected officials reminds me that so often the most important leadership is at the local level," Callaway wrote from California, a few miles from the wildfires. We couldn't agree more, and knowing that Washington County's finest are doing their part to help Oregon's neighbor makes us proud to call this area home.